Kenosha County Sheriff’s Department officials now believe they have all suspects connected to a fatal shooting Thursday evening in custody. Joseph Riley, 23, of Wheatland was shot and died at his home on 71st Street in Wheatland. 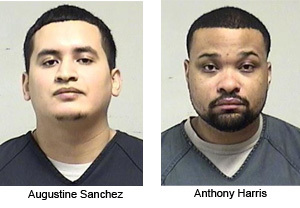 The third and fourth suspect in the case were identified in a Sheriff’s Department new release as: Augustine Jesus Sanchez , 20, of Racine, and Anthony Lee Harris II, 23, of Racine. Deputies responded to the 71st Street address at about 10:30 p.m., Thursday, after receiving an anonymous phone call that there had been a shooting there. Riley and a woman who had been shot were there. Two other people are believed to have been at Riley’s house when the incident began. One fled the scene and that person’s identity is known to the sheriff’s department. The whereabouts or identity of the fourth person is not known, Beth said Friday. Two other suspects in the homicide — Markeith Wilson, 20, of Racine and Demarco Hudson, 17, of Racine — also are in custody. Both had been shot when they were taken into custody at a gas station/fast food restaurant on Highway 50 in Paddock Lake shortly after the shooting in Wheatland was reported. Beth said he believes they were shot by Riley returning fire at the initial crime scene. A GoFundMe page to raise money for Riley’s funeral expenses has been established.